We have wrapped up a wonderful visit with Mama Fashion. She was with us from Friday until her work meeting Wednesday morning in Boston. So let’s review what we did. 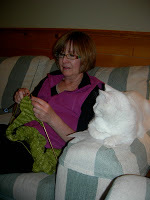 MamaF gave knitting lessons to her grandkitty. 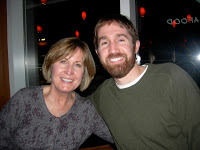 We dined at a new restaurant in Concord, O Steaks and Seafood. And we thought it was O so good. Get it? O Steaks and Seafood was O so good. I crack myself up. We got manis/pedis (not J, in case you cocked an eyebrow) and this time, we did not go for the Shellac option. Although the polish did last the full 2 weeks they promised, I think it made my nails weaker because I peeled off the remaining polish. Overall, I’m still not sure I am a convert with manis/pedis. I still don’t love getting them (I always inevitably bleed when they are working on my feet). And my polish is already off (from Saturday). But, I will continue to go with MamaF when she needs a partner. MamaF and I got some vitamin D and went snowshoeing on her lunch break. We have been having funny weather here. No new snow, but the temps have risen to 40 one day and dropped to 0 the next. Today it is 50 degrees. I’m almost tempted to eat my lunch outside! We tried on funny glasses. 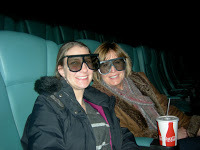 Okay, that was because we saw Sanctum in 3-D Imax. What a great movie. It’s an intense adventure thriller about cave divers who become trapped in unchartered cave territory because of a storm. We were on the edge of our seats pretty much the whole time. J has caved before, but after seeing this movie, I think I might have taken caving off my bucket list. Anyways, we are hoping her company schedules another meeting in Boston very, very soon so she can come back! In the meantime, we have another visitor coming this weekend!! 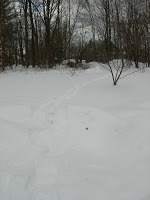 Way to get mama fashion out for a snowshoe!